My first date with Pete was at a coffee shop. He showed up with his own mug and asked the barista if they'd give him a discount because he brought his own mug. The barista said, "We can do 10 cents off." Pete said, "Tyler usually gives me 100% off." The barista said, "We don't have a Tyler here. Ten cents is the best we can do." Pete then looked at me and said, "You know Tyler, right? Tyler? The Tyler that works here?" He gave me a nod like he really wanted me to collude with him. I told Pete the truth, "I've never been in here before. I don't know." Pete said, "Thanks for nothing. Both of you," and hurried out without another word. The barista felt bad for me and gave me half off a drink. So at least something good came out of it. Obviously Pete knows Tyler. Tyler gives 100% to those who blow him under the counter. Even adds cream as a courtesy. Mildly salty, but he knows how to brew a good cup of Joe. Barista proceeds to say "Oh! That Tyler.....yeah, we fired him for giving out free coffee to morons." 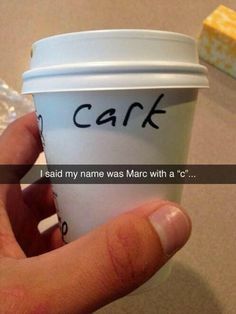 It's not like that barista even knew the names of her co-workers anyway. Except that he didn't really leave. He made a clumsy jump over the counter in an attempt to fill his mug. The barista called the police; this is his mugshot. Well, Cynthia got a discount for bringing a mug. I can see how Pete might have been confused.